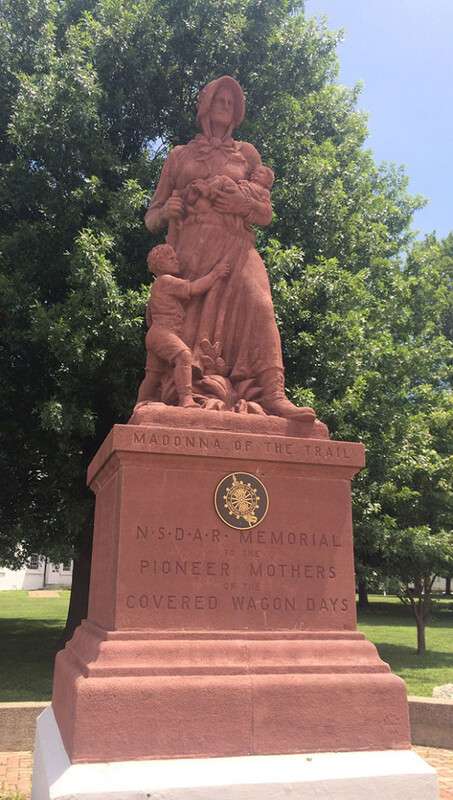 The idea of a highway memorial to the Pioneer Mothers of the covered wagon days began in Missouri around 1909. Congress passed a bill in 1910 establishing the Old National Trails Road, combining existing trails from the end of the National Road (Vandalia) to the Pacific Ocean, that would form a straight line. In 1911, the National Society Daughters of the American Revolution established a national committee known as the National Old Trails Road Committee whose work was primarily to establish the Old Trails Road as a great National Memorial Highway. In 1912, the National Old Trails Road Association came into being and stated in its bylaws that, "the object of the Association shall be to assist the Daughters of the American Revolution in marking Old Trails and to promote the construction of an Ocean-to-Ocean Highway of modern type worthy of its memorial character." By 1924, plans for the proposed markers had evolved to a new plan that involved the erection of 12 large statues along the Old National Road. 'The Madonna of the Trail' design was accepted by the members at the annual DAR conference in 1927. Mrs. John Trigg Moss, chairman of the DAR committee, suggested the design, and the monuments were created by the St. Louis sculptor, August Leimbach. The Madonna of the Trail is a pioneer woman clasping her baby, with her young son clinging to her skirts. The face of the mother, strong in character, beauty, and gentleness, is the face of a mother who realizes her responsibilities. It has feeling of solidity - a monument which will stand through the ages. The figure of the mother is of heroic proportions - 10 feet high and weighing 5 tons. The base on which the figure stands is 6 feet high and weighs 12 tons. This base rests on a foundation that stands 2 feet above ground level, making the monument 18 feet tall. The figure and the base are made of algonite stone, giving the monuments the warm, pink color of Missouri native granite. On two sides of the base, historic or local commemoration data is inscribed. This monument, which was dedicated on October 26, 1928 sits on the southwest corner of the Old State Capitol grounds in Vandalia, Illinois. Originally the monument stood at the south entrance of the former Old State Capitol. For aesthetic reasons, the state moved the monument to its present location in 1939.